Lancaster, CA- MGS Custom Bikes is proud to announce the addition of their new high performance line of True Dual exhausts for ’95-2013 baggers and dressers. Some years back MGS purchased a Dyno and through the process of tuning bikes, Mike Stafford, president and founder of MGS Custom Bikes, has created a custom line of fine-tuned high performance exhaust systems that outperform the competition. Over a year of extensive research and development went into these pipes and Mike far exceeded his goal…to build a horsepower producing exhaust. MGS Custom Bikes’ new exhaust systems do INCREASE horsepower…PERIOD! (Independent studies and dyno results are available upon request) Riders will be shocked at their horsepower gains the second they install a set of our new True Duals,” Chris Stafford, VP Marketing stated. MGS has won some of the most highly esteemed shows in the motorcycle industry, such as: The Grand National Roadster Show for the title of America's Most Beautiful Motorcycle; The Rat's Hole in Florida and the Discovery Channel's Bike Build Off, just to name a few. MGS has also been on the cover of every major motorcycle magazine as well as countless features inside. MGS Customs’ True Dual exhaust system has produced an average increase of 12+ foot pounds of torque on a stock FL model Harley-Davidson. Better results have been achieved, but are not ordinary. These new True Duals are available in black ceramic or chrome with your choice of three different style tips. 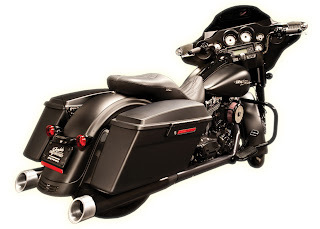 MGS designed them so that ONE part number will fit ALL 95-2013 Harley-Davidson FL Touring Models… dealers will only have to stock one set of pipes in order to fit all FL Touring Model applications. email them at sales@MGSCustomBikes.com or check them out online at www.MGSCustomBikes.com.